"This gentle, yet powerful, foaming cleanser is enriched with botanical actives to provide nourishment and protection every time you cleanse. It is a perfect organic skincare option for those who want a simple, traditional cleanser with clean, non-toxic ingredients. 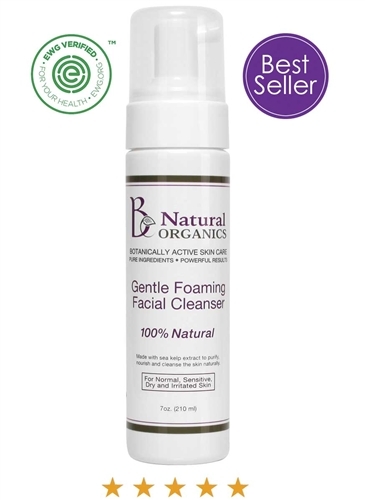 Gentle Foaming Facial Cleanser is as valuable for what it doesn't contain as for what it does; you won't find any potentially irritating ingredients here so it's a great choice for truly sensitive skin. Rosehip seed oil soothes and treats damage from overexposure to the sun. Sea kelp conditions, hydrates and helps detoxify the skin. " This is the perfect face wash for those of us with dry, sensitive skin! My skin tends to get flaky, especially on my forehead, and I do have a little rosacea on my cheeks. This facial wash comes in foam form, and is very light, produces a nice lather, and rinses off easily. It doesn't dry out my already dry skin or irritate my rosacea, this is a great, gentle cleanser, and it's Vegan! "This lotion was specifically designed for sensitive skin and fragile skin. This organic skincare product won't burn, sting or cause irritation. Gentle Face Lotion is rich in antioxidants (including powerful polyphenol compounds) to help repair damage caused from the sun and oxidative stress. The antioxidants also serve a protective function against daily sun and environmental pollutant exposure. The light, soothing base of certified organic Bulgarian rose distillates nourishes, calms and conditions the skin with a mild natural aroma. 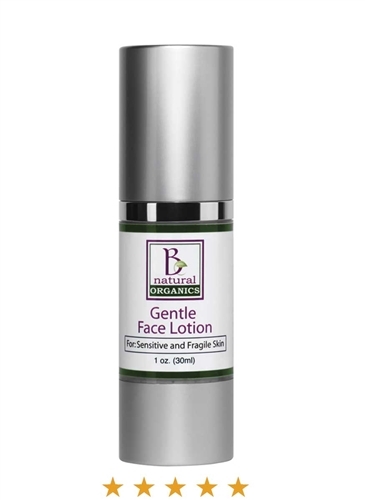 Unlike other synthetic-based moisturizers for sensitive skin, Gentle Face Lotion does not contain harmful chemical preservatives, additives or synthetic fragrances." One of my favorite things about this lotion is how lightweight yet moisturizing it is; it quenches my dry skin, but does not cause any break outs, it doesn't sting or irritate my skin in any way. The face lotion has no real scent which is perfect for those of us with sensitive skin, and it absorbs quickly leaving my skin with a soft glow! If you're like me, and you have dry skin but hate the feeling of thick, greasy creams that won't fully absorb into your skin then I would HIGHLY recommend this face lotion! As an added bonus it's also Vegan. Overall, I would high recommend both products, especially the face lotion.